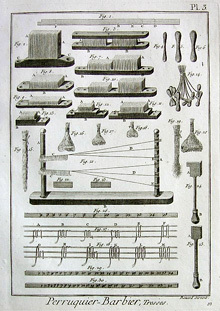 Leisure Projects celebrates the newest addition to our collection, a small etching of tools from the French wig trade circa 1780, with the quote below from Theodor Adorno . ”(…) Everybody must have projects all of the time. The maximum must be extracted from leisure. This is planned, used for undertakings, crammed with visits to every conceivable site or spectacle, or just with the fastest possible locomotion. The shadow of all this falls on intellectual work. It is done with a bad conscience, as if it had been poached from some urgent, even if only imaginary occupation. To justify itself in its own eyes it puts on a show of hectic activity performed under great pressure and shortage of time, which excludes all reflection and therefore itself. It often seems as if intellectuals reserved for their actual production only those hours left over from obligations, excursions and appointments and unavoidable amusements. There is something repulsive, yet to a certain degree rational, about the prestige gained by those who can present themselves as such important people that they have to be on the spot everywhere. They stylize their lives with ham-acted discontent as a single acte-de-presence. The pleasure with which they turn down an invitation with reference to another previously accepted, signals a triumph between competitors. As here, so generally, the forms of the production process are repeated in private life, or in those areas of work exempted from these forms themselves. The whole of life must look like a job, and by this resemblance conceal what is not devoted to pecuniary gain. But the fear thus expressed only reflects a much deeper one. The unconscious innervations which, beyond thought process, attune individual existence to historical rhythms, sense the growing collectivization of the world. Yet since integral society does not so much take up individuals positively within itself as crush them to an amorphous and malleable mass each individual dreads the process of absorption, which is felt as inevitable.